This 1893-S evaluated during PCGS’ Meet the Expert sessions is now valued at $53,000, according to the PCGS Price Guide. Professional Coin Grading Service's (www.PCGS.com) Meet the Expert sessions at the ANA concluded in an unexpected way. On Saturday, August 13, 2016, the final day of the coin show, a show attendee presented PCGS CoinFacts President Ron Guth with two coins to assess: the first was a relatively common $20 gold piece valued at around $1,300, but the second was a rare, ungraded 1893-S $1, the rarest date in the Morgan series. Once authenticated, the coin would earn the grade of PCGS AU58 and be valued at $53,000. The coin's owner, a Los Angeles resident who wishes to remain anonymous, discovered the coins tucked away in a wooden box in the home of his recently deceased father. Within the box were the two coins he would eventually present to Guth at the ANA, the $20 gold piece and the 1893-S.
New to numismatics, the anonymous coin owner researched both coins online, coming to the natural conclusion that the gold piece would be the most valuable. After seeing TV advertisements for the ANA World's Fair of Money, he decided to take both coins to the coin show for appraisal and possible selling. After walking the floor briefly, he approached a dealer's table and asked what the dealer thought of both coins. The dealer, immediately recognizing the Morgan Dollar's significance, directed the man to the PCGS booth, recommending he get it graded. There he met Guth. "I walked up to the PCGS booth and said, 'Hey Ron, I have this coin, I was told it was a pretty nice coin. Ron inspected the coin and said, 'This is a very nice coin you have; this is the real McCoy. These rarely come by in this condition,'" the coin owner recounted. "When he [Ron] said the coin is worth around $40,000, my jaw just hit the floor like a cartoon character. In my head, I had a coin worth anywhere from $1,300 to $3,000." Although 100,000 1893-S Morgan Dollars were minted, this particular date is considered the most valuable due to its rarity; only an estimated 10,000 survive in all grades today. However, the real value of the coin lies in its high grade, AU58. Before the man had his Morgan Dollar assessed and graded, there were only 12 known PCGS AU58 examples of 1893-S $1 Morgans. 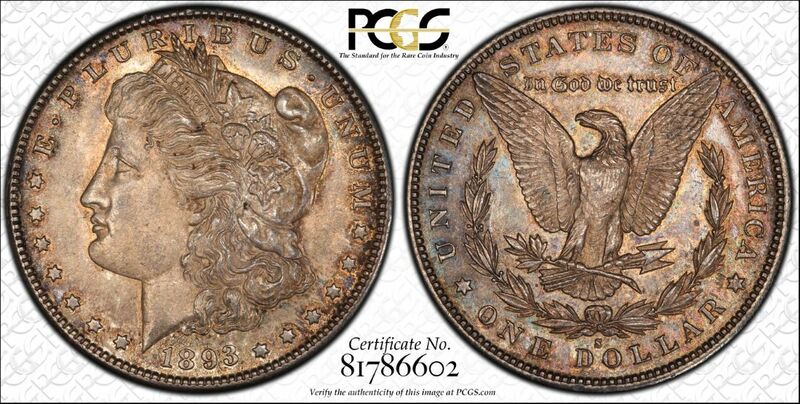 This treasure find brings the total to 13 PCGS AU58 1893-S examples. PCGS regularly holds Meet the Expert sessions at coin shows throughout the year. In these sessions, renowned numismatic experts assess coins presented to them by the public, on a walk-up basis. Guth was conducting his final Meet the Expert session of the coin show, when one of those "rare and surreal moments" occurred. "He [the owner of the 1893-S] thought the large gold piece was the more valuable of the two coins," said Guth. "When I explained that the gold coin was only worth its melt value of around $1,300, but the 1893-S $1 was a nice AU55, possibly AU58, worth $40,000-plus, he was taken aback. "He immediately submitted the coin, which came back PCGS AU58. Discoveries as significant as this are rare, but this is why we hold these events. One never knows what treasures are out there waiting to be uncovered." After the revelation of his Morgan Dollar, the coin's owner has decided to sell rather than keep the coin. According to the man, who previously "did not even know what AU meant," this coin is better suited in a collector's hands. "I'm going to sell it. I just have to. Someone else will appreciate the coin, way more than I would. Whoever buys the coin, I think both of us will be happy," said the man. For more information on the 1893-S $1, visit www.pcgscoinfacts.com/Coin/Detail/7226/58. A hi-resolution image of the exact coin submitted during the ANA can be found at www.pcgs.com/cert/81786602.